In this "biography of a single day," the burning of the White House by the British during the War of 1812 is told from the viewpoint of the people who were there, including First Lady Dolley Madison, a British officer, and a nine-year-old slave. Jane Sutcliffe draws upon first-person accounts to recreate a compelling chronology of the events of August 24, 1814. Jane Sutcliffe is the author of Leonardo’s Monster, The Attack on Pearl Harbor, and Stone Giant: Michelangelo’s David and How He Came To Be, as well as nearly two dozen biographies for young readers. She lives with her family on a farm in Tolland, Connecticut. *If it seems that the War of 1812 doesn't thrive in the classroom, crammed as it is between the massive units on the Revolutionary and Civil wars, look to Sutcliffe's title as an antidote. With just enough requisite scene setting, the author launches straight into a gripping reconstruction of the events of August 23 to 24, 1814, when the British invaded Maryland and the nation's capital, burned its government buildings, terrified those citizens who hadn't already fled, and then snuck silently out of Washington in the middle of the night. The reporting is kept lively by its heavy reliance on primary source material, with witnesses and participants ranging from an American soldier who went to battle in his formal dancing pumps, to British admiral Cockburn, who couldn't resist taunting the people he vanquished, to Dolley Madison, who kept up a running letter to her sister even as she ordered dinner as usual and packed up the silver (and George Washington's portrait), just in case. Throughout the narration Sutcliffe keeps a keen eye open for those details that convey the terror of an attack, and she reminds readers how coverage of such an event might play out today: "Admiral Cockburn might have called a press conference aboard his flagship, the Albion. There might have been . . . a banner proclaiming 'Mission Accomplished.'" With a gallery of well-selected images, source notes, bibliography, index, and illustration credits which supplement the captions, this account will be a first-rate addition to the American History collection. Sometimes referred to as “America’s Second Revolution,” the War of 1812 found British forces invading the newly founded capital city of Washington, DC. Following the Battle of Bladensburg and the embarrassing retreat of the U.S. militia, the British arrived at the capital during the most oppressive weather conditions imaginable to find the city largely abandoned. 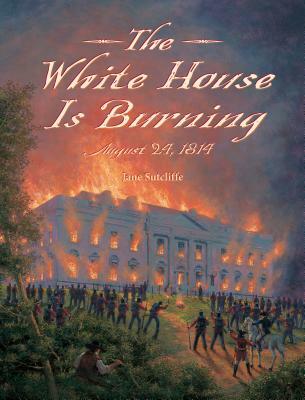 In this hour-by-hour narrative, Sutcliffe provides a harrowing account of the day, culminating with the burning of both the Capitol building and the iconic White House, the flames of which could be seen as far away as Baltimore. Extensively researched and thorough in coverage, this book gives readers a full view of this compelling story and the events leading up to the conflict. The title is enhanced by the original maps, portraits, paintings, and drawings of key personalities. Sutcliffe’s use of primary sources is impressive as she weaves together a seamless tale from a variety of perspectives. The author draws upon firsthand accounts from a variety of sources (respected military personnel, political figures, everyday citizens, and slaves) to provide an impartial, well-rounded look at this pivotal day in our nation’s history and its aftermath. Certain to spark interest in history aficionados, this title would be a welcome purchase for most collections. A graceful narrative skillfully draws from primary sources to shed light on a key historic day. In 1814, the United States lost a battle to the British on the outskirts of Washington, D.C., with shocking results. American soldiers fled from the battlefield, and many residents of the capital fled from the city. "Then the unthinkable: foreign invaders marched into Washington, torching first the Capitol building, then the White House," reads the introduction to this history. The chapters that follow detail the day, starting before dawn and going through night, with two final chapters about the aftermath. Sutcliffe deftly sets the battle and invasion in the context of the War of 1812, introduces major players, and explains unfamiliar material, like the use of rockets as weapons. Quotes from those involved make the tale personal, with reminiscences of a 15-year-old tourist, two young slaves and a British officer. Many apt observations come from first lady Dolley Madison, who wrote a letter throughout the day as she waited bravely in the White House until danger was imminent. The polished prose is matched by an attractive, open design with frequent headings, pullout quotes and effective visuals, including paintings, etchings and maps.